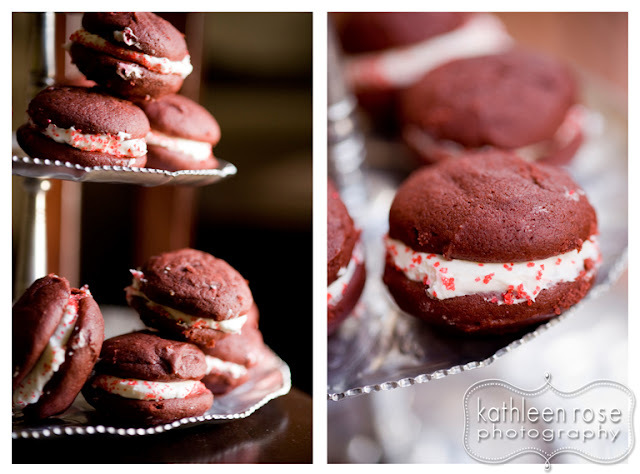 Kathleen Rose Photography Blog: Katie in the Kitchen | Valentine's Day red velvet whoopie pies! 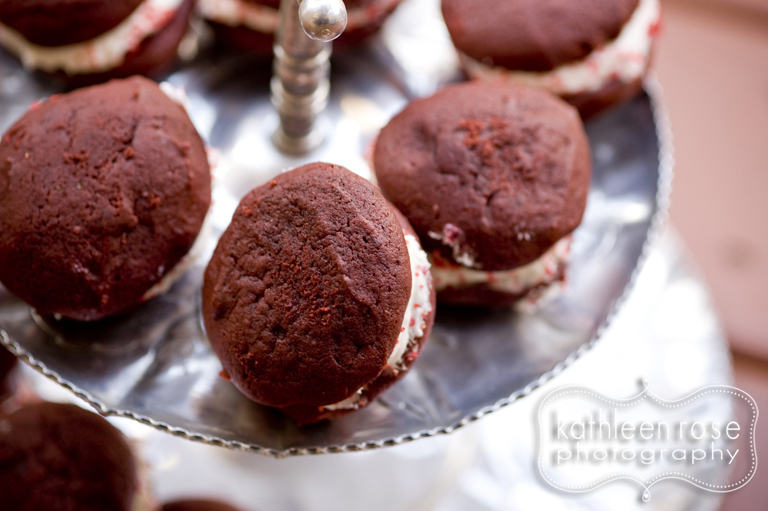 Katie in the Kitchen | Valentine's Day red velvet whoopie pies! Let's just say that I do not have a ton of cooking and / or baking experience. Sure - I baked sugar cookies to give away at my wedding (with lots of help) and my brownies from a box are Ah-mazing - but I am not a from scratch kind of girl. 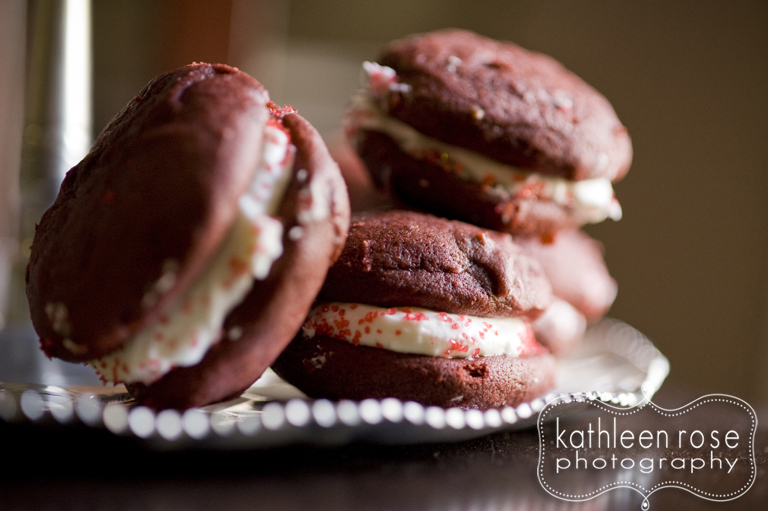 So I am starting a new project that I am o-so-creatively calling Katie in the Kitchen. 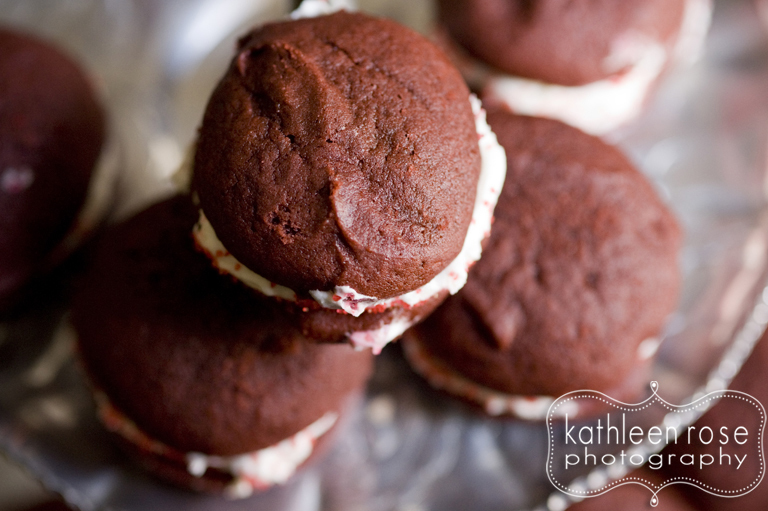 I will be choosing recipes for baking or cooking that I think Dave and I would enjoy and documenting all the fun. 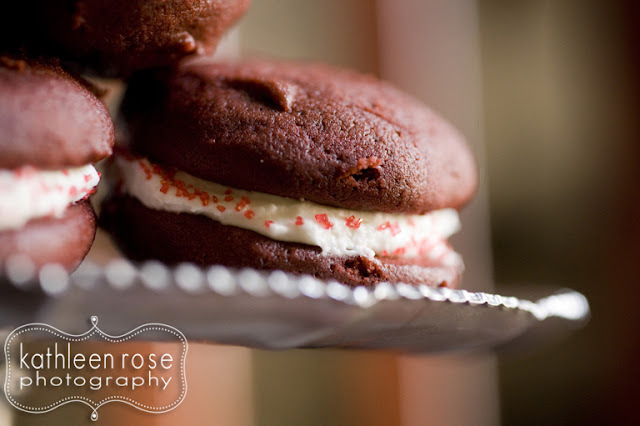 First project - in honor of Valentine's Day - Mini Red Velvet Whoopie Pies. 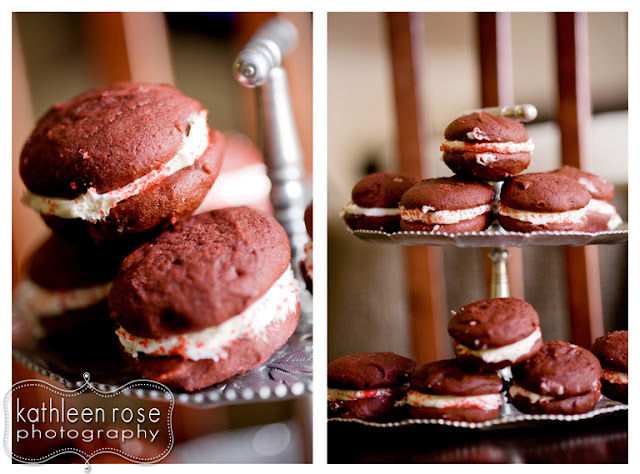 These delicious little guys are part cake, part cookie and part sandwich. Also - they are adorable. Probably the cutest thing you will ever eat. I found the recipe at Better Homes and Gardens dot com. 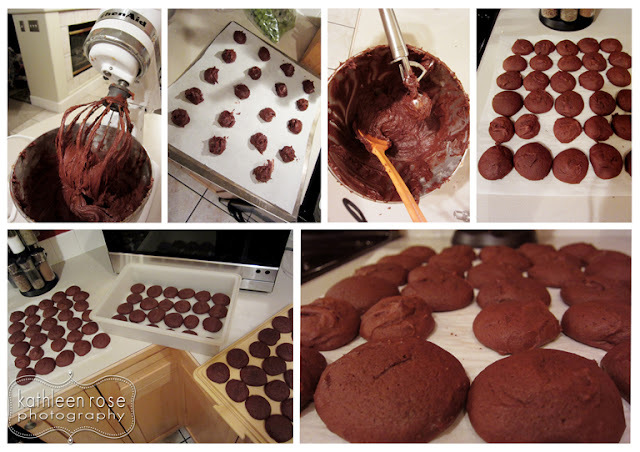 Here is the recipe if you would like to make them yourself. Note: I highly recommend having a great friend to bake with. It is more fun than baking alone- plus she is the proud owner of a Kitchen Aid stand mixer. This device is truly magic. Here is the dry portion of the process. Here is the super sticky wet portion. I used a small ice cream/cookie scoop. It worked so much better and was more fun than a boring old spoon. 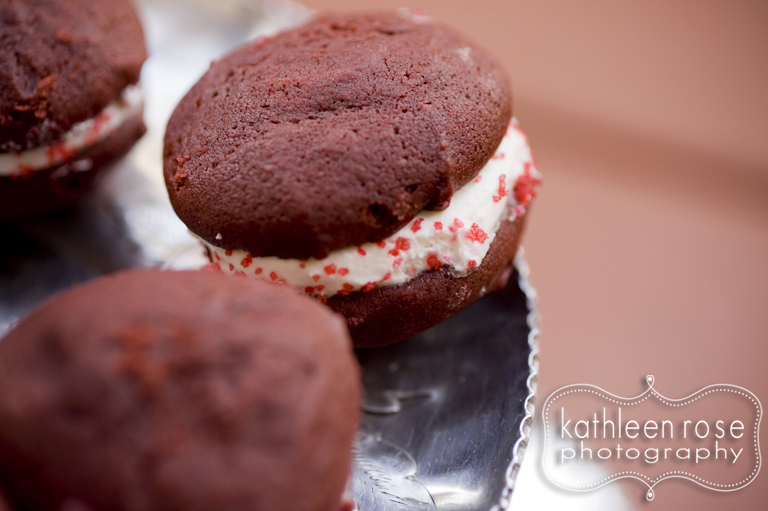 The batter is really sticky - which makes for great cookie/ cake/ sandwiches but also created really sticky fingers. Note: I doubled the recipe and when you do this it requires two whole bottles of red food coloring. I recommend hiding your white dish cloths. special thanks to Christie for the mixer and for letting me hold your baby for hours at a time! 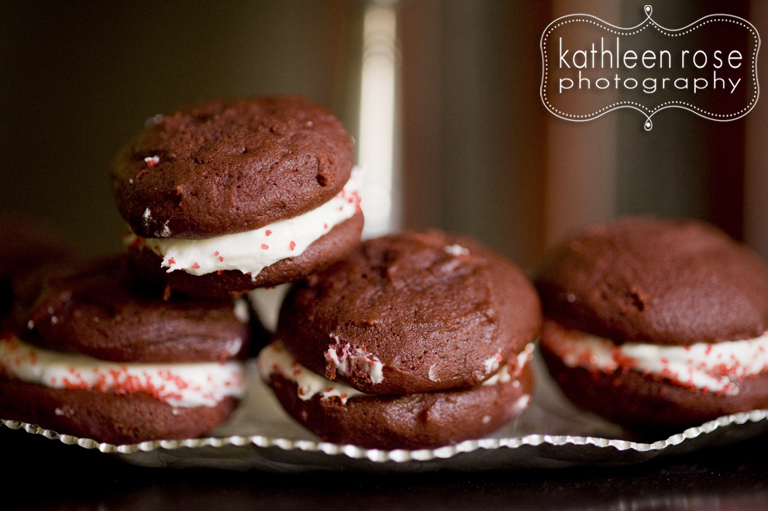 I would just like to testify that these are as good as they look! You are certainly welcome anytime you want to come bake wonderful goodies and hold baby E. I'd say its a win for everybody involved.